In home construction, joists are the horizontal supporting pieces of wood that run between foundations, walls or beams to support a ceiling or floor. They are most often made from wood but with longer openings and/or weight, engineered wood or steel are used. The wider the span covered by the wood joist, the larger the joist needs to be to support the load with minimal movement. 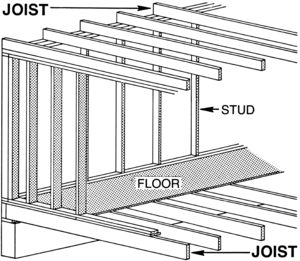 Joists are one of the many components that go into building a house, that are hidden behind the walls and floors. To learn more about home building concepts and terminology, use our homeowner glossary and homeowner library. Janka Hardness Test – A test used to compare the relative hardness of hardwoods used for flooring. Joist – A horizontal structural member or beam that supports floors and ceilings; usually 2″ x 10″s or 2″ x 12″s spaced 16 inches on center. Joist Hanger – A metal angle or strap used to support and fix the ends of wood joists or rafters to beams or girders. Junior Lien – When a property is foreclosed, lenders are repaid in a particular order, established by the loan documents. The lender with the first claim to repayment is said to hold the first mortgage, and a lender whose repayment order is after the first claimant is said to hold a junior lien. Junior Mortgage (also called a Secondary Mortgage) – A mortgage whose claim to repayment is second to another mortgage. Michelle Berman is a senior at the University of New Hampshire, majoring in business with a minor in marketing. During her senior year at UNH, Michelle was an intern at Home Tips 4 Women where she worked on ... tips for homeowners, here on our website plus other marketing projects.